Helen Harris passed away on Christmas Eve evening in her home in Woodland Hills California after an 8 year battle with aggressive metastatic breast cancer. 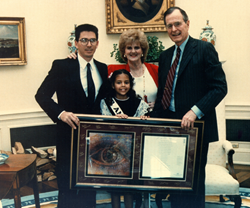 As the founder and volunteer President of RP International for over forty years, she pioneered and championed many of today's greatest breakthroughs in restoring and preserving our children’s eyesight. 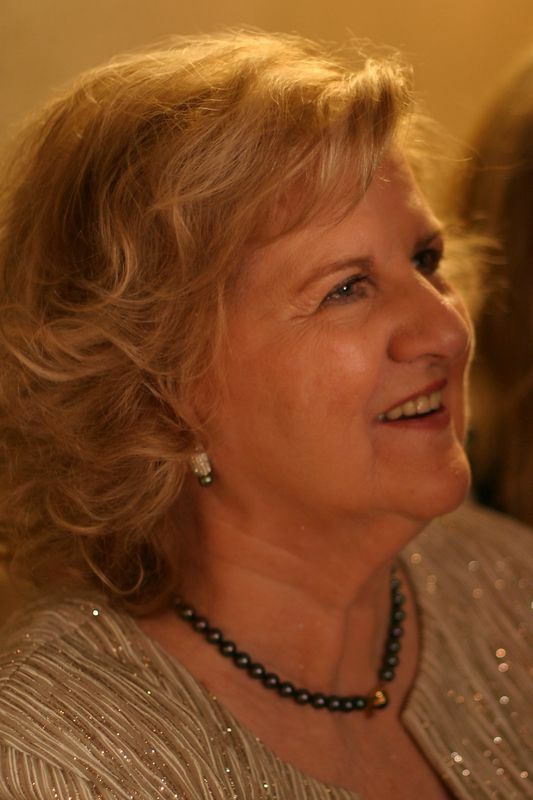 Helen Harris’ RP (Retinitis Pigmentosa) International founder dies in her home in Woodland Hills, California after an 8 year battle with breast cancer. Helen Harris passed away on Christmas Eve evening in her home in Woodland Hills California after an 8 year battle with aggressive metastatic breast cancer. As the founder and volunteer President of RP International for over forty years, she pioneered and championed many of today's greatest breakthroughs in restoring and preserving our children’s eyesight. Retinal cell transplants , adult stem cell transplantation, groundbreaking treatments, procedures and technologies all aimed at curing RP, Macular Degeneration and related allied diseases which affect millions of Americans. Sadly, one of Helen’s favorite contributions to helping blind and visually impaired fully enjoy the holiday season, The Eyes of Christmas and It’s a Wondeful Life described for the blind aired just a few hours after she had passed away. 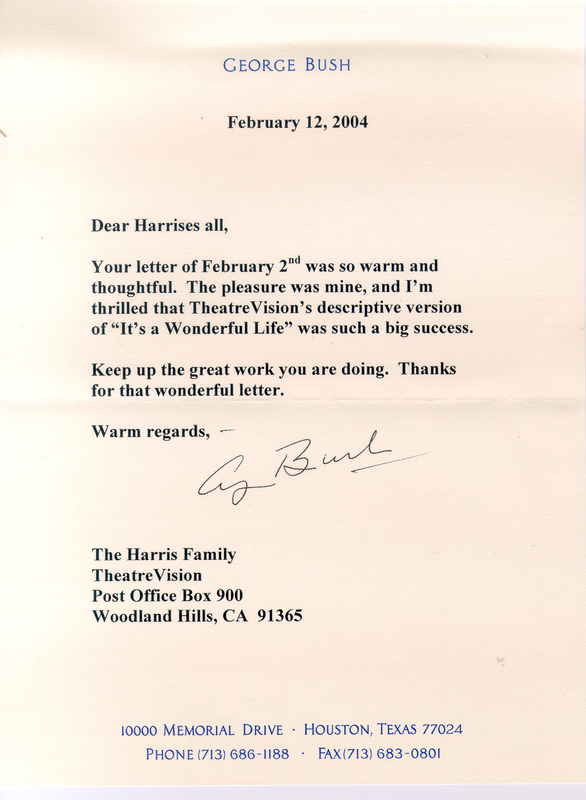 NBC’s, “It’s a Wonderful Life” narrated in Descriptive TheatreVisionTM by former President George H.W. 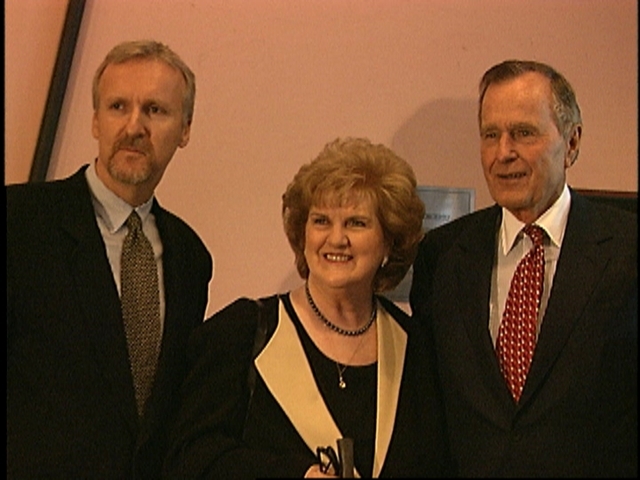 Bush, and a second charity production, called “The Eyes of ChristmasTM” a holiday classic and the only television show in the country specifically made accessible with TheatreVisionTM. 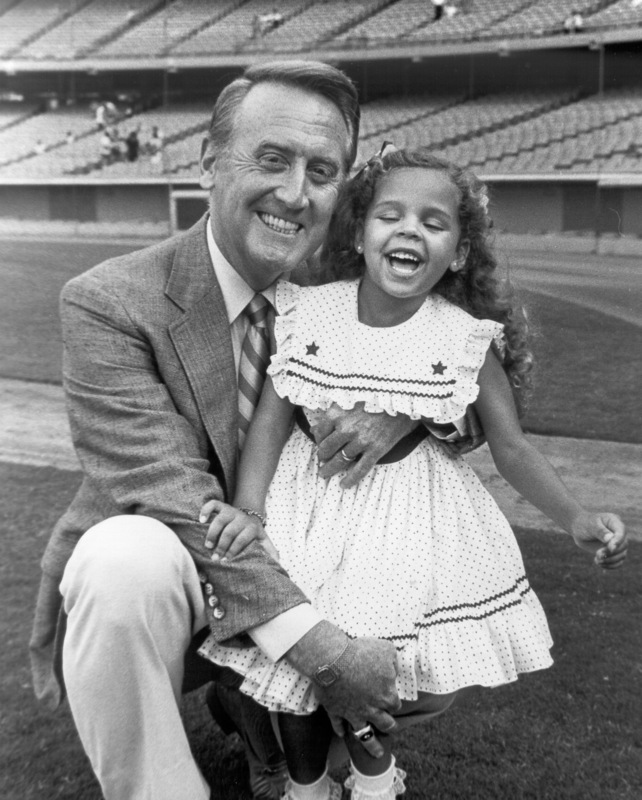 The host from inception has been Vin Scully, Dodgers hall of fame announcer and Bob Hope in Sight Telethon Co-host. The show is broadcast on Christmas Eve and Christmas morning nationally on ION Media Network and on FOX TV in Los Angeles. The broadcast features Co-host Clive Davis, musical performances and audio holiday description from many top stars ranging from George Clooney to Garth Brooks. Helen created the Vision AwardsTM to bring national attention to pioneering visionaries in medical research, entertainment, the arts, music and technology. All in an attempt to promote and advance the need to cure RP and restore eyesight to 26 million Americans. Before going blind from RP, Helen was an artist and painter, her collection of paintings created while over 99% blind, will be donated to the charity then auctioned, in an attempt to raise $1,000,000+ to endow a permanent medical fund in her name and to guarantee that all future young researchers have a place to turn for funding and that RP and Macular Degeneration patients calling in for free on the 800 Fight RP line continue to receive free counseling, doctor’s assistance and even talking computers. It is Helen’s fondest wish that the volunteer-based effort she started be funded to completion, with experimental work now entering mainstream medicine, she may just have succeeded in doing what every major medical establishment had told her 40 years ago was impossible, restoring sight to the blind! The charity and her family remain committed to finishing what Helen took from just a dream to a potential cure. Funding is desperately needed now to finish this extraordinary miracle of restoring eyesight to our children and loved ones. Please consider donating to RP International the non-profit charity Helen established almost half a century ago by visiting. http://www.RPInternational.org, Calling (800) Fight-RP or mailing a contribution to RP International, Post Office Box 900, Woodland Hills, California 91365. LINK: Eyes of Christmas previous release with photos, video and PDF downloads. "The Eyes of Christmas" telecast benefits RP International, the nation's leading non-profit fighting Retinitis Pigmentosa (RP) and other degenerative eye diseases. NBC will air “It’s a Wonderful Life” nationally in TheatreVision™, narrated by former President George H.W. Bush, on December 24th at 8:00 p.m. ET. This year’s finale to “The Eyes of Christmas” will begin at 6:00 a.m. ET on ION Television Christmas morning. More information is available via RP International's web site, http://www.eyesofchristmas.org. 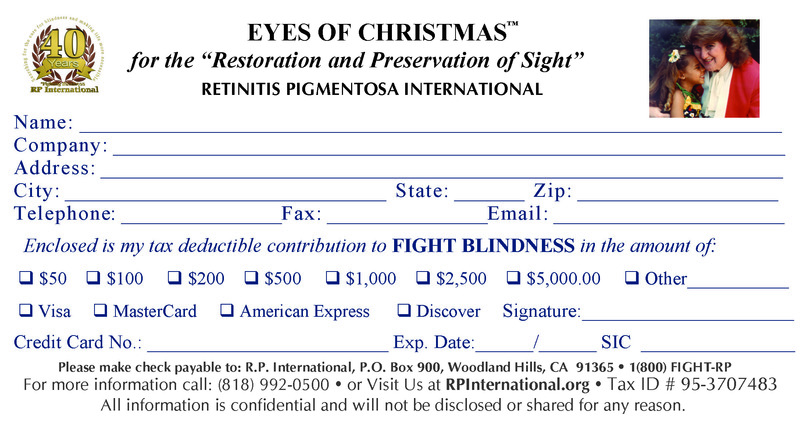 The song, “The Eyes of Christmas” can also be purchased by calling RP International at (818) 992-0631. Retinitis Pigmentosa (RP) is a degenerative, hereditary eye disease that afflicts tens of millions of people worldwide. When diagnosed with the condition 40 years ago, Helen Harris was a homemaker in Pennsylvania. Once she found out that she had passed on RP to two out of her three sons, she started a mission to save vision by founding RP International (RPI). 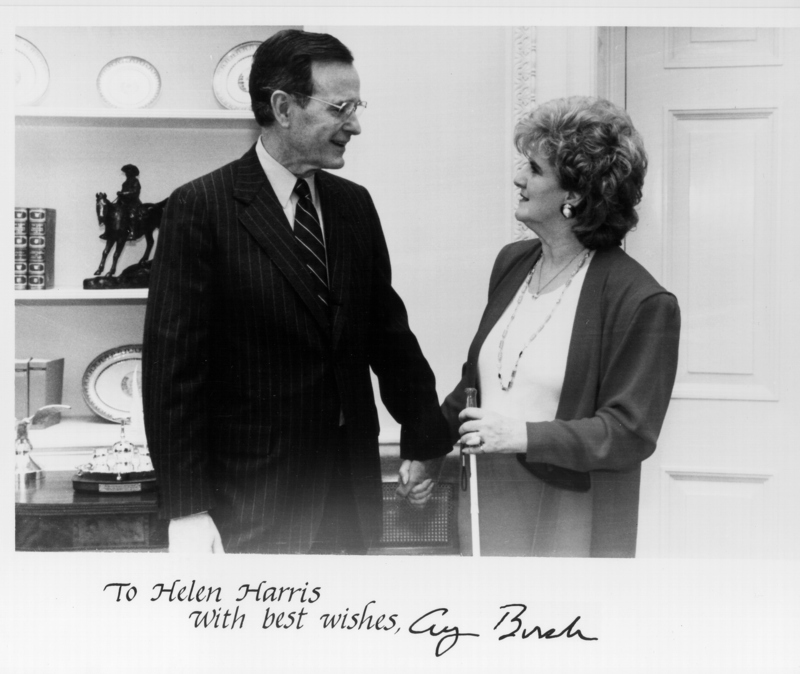 Since then, Harris’ non-profit organization has led the fight against disabling eye diseases that afflict over 31 million people in America and worldwide. RPI has raised over $5 million to date during the past 40 years of telethons and special events, including its annual Vision Awards fundraiser for medical research for restoring vision. RPI is also behind the first successful retinal transplant that has fully restored vision in blind patients. RPI has also enlisted other donors into contributing more than $300 million directly to medical research for eye health. Whether Retinitis Pigmentosa, Macular Degeneration, Usher's Syndrome, Batten's Disease, or other visual impairments, RPI has helped pierce the darkness through the following initiatives: sponsoring medical research and communication amongst leading researchers; providing human services for blind and sight-impaired children, young adults, and seniors; educating the public, the medical profession, and those suffering from disabling eye diseases; pioneering TheatreVision™, an innovative technical development invented at RPI that permits the blind and sight-impaired to watch movies and television with their sighted family and friends; the annual “Eyes of Christmas” special broadcast, raising awareness and bringing holiday cheer to the blind; as well as the annually televised Vision Awards (http://www.visionawards.org), which honors major luminaries across the fields of entertainment, science, sports and the arts. Harris has partnered with many of the biggest stars and movie studios to produce TheatreVision™ versions of major feature films, including James Cameron, who lent his voice for the audio description of his blockbuster hit, "Titanic." RP International, PO BOX 900, Woodland Hills, CA 91367, or online at http://www.rpinternational.org. For information please contact Parvene Michaels at 818-992-0631, or email info@rpinternational.org.